I was able to see a few different warblers passing thru my yard. They do love these berries. Sorry about the photo quality, these images were all taken thru my dining room window. Below is a Tennessee Warbler with a Chestnut-sided Warbler. The Cape May Warbler's hung around for a week or more. I believe below is a Nashville Warbler. Out trumpet vine bloomed for a while and the hummers love these blooms. 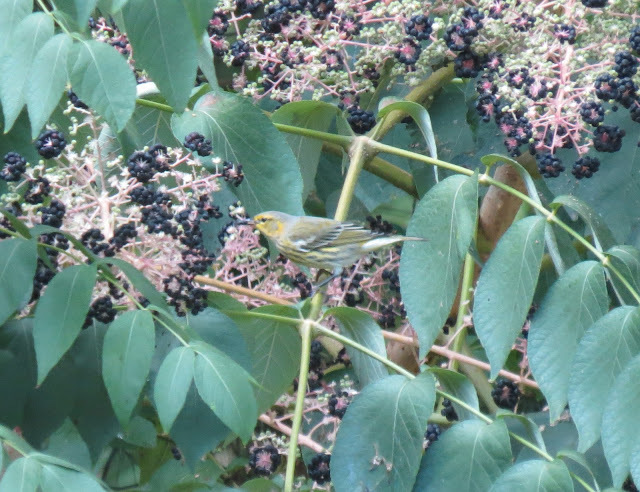 As of Sept 21st I was seeing these warblers below, on the top photo together is the Tennessee Warbler on the left and the Cape May Warbler on the right. 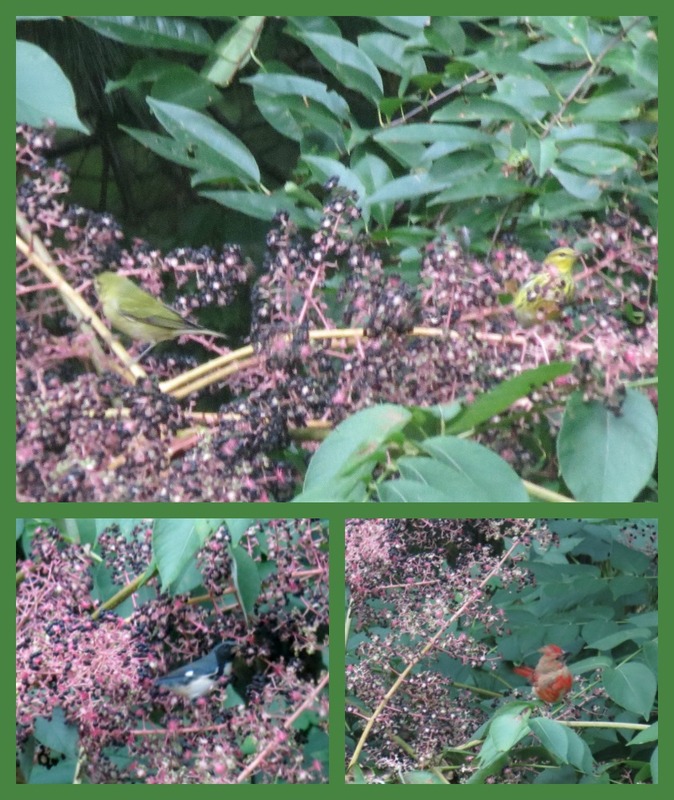 Bottom row is the Black-throated Blue Warbler and a Cardinal. 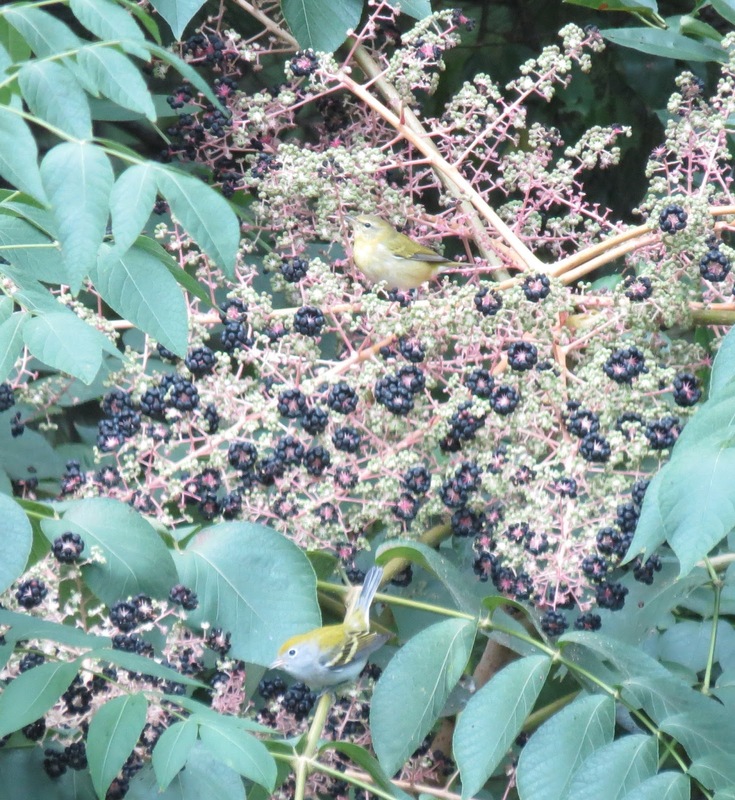 The birds are just loving these berries, yum! That trumpet vine is lovely, such dramatic flowers not seen around here very often. That certainly has a lot of berries on for all your lovely birds to feed on Thanks for hosting and have a wonderuful weekend Eileen. Wonderful feast of berries Eileen. Love the hummer at your trumpet vine. Thanks for hosting and Happy October to you too. I wish I had a garden ike yours :) Lovely warblers. Nice pics. Have a nice weekend. The birds seem to enjoy their meal in your garden. Nice photo of humming bird feeding from the red trumpet bloom. Cute critters. Have a wonderful weekend! Those warblers are such pretty little birds. I love the hummer at the trumpet flower! Hello Eileen! Those berries certainly attract the birds and they are so plentiful! Lovely to see the hummingbird enjoy the trumpet vine! Good morning Eileen. Thanks for lettting me join in to your warbler fest today. Those garden blooms are very attractive and must hold lots of juicy bugs for the birds. Enjoy the rest of your weekend. Those berries do look very appetizing! The birds must love them! Hope you are having a beautiful day! Wonderful sightings from the comfort of home! I'd love to have a yard which attracted hummingbirds and other migrating songbirds, but there is little space because a lawn must be maintained in the entire area 20 feet from our 140 foot lakefront shoreline. That's 280 square feet of manicured lawn, plus a 20 foot utility easement on one side of the home which we own but must obtain approval for any changes. Of course, the lake brings in lots of waterbirds! Love those cute little Warblers! I thought all our Hummingbirds had gone south, then yesterday there were two at our feeders. It is poignant seeing 'the last one' of these critters for the season! Our hummers are gone. The warblers, too. That's an adorable little warbler Eileen. I'm back to sharing with some critters I saw while visiting out west. How fun to see a variety of warblers. Hope you have a nice day and thanks so much for hosting! Eileen I love your warblers and I would so love to see a little hummingbird in my garden. You are very lucky. you are getting a lot of warblers, i am getting zero!!! they camouflage well within those berry bushes!! i have not seen a hummingbird in a few weeks, i hope it gets a move on soon and didn't get left behind by it's family!!! have a happy weekend eileen, and many thanks for hosting...146 times, WoW!!! that might be a record!!! the berries are great lures! Hi Eileen, lovely to see your little birds, how special to have them in the garden. Have a lovely weekend and thank you for hosting! You always manage to show interesting birds that I discover in your posts! That's great that your yard is so appealing for birds. Definitely worth keeping the windows clean for! I'm back from a midweek break. You let beautiful carmine berries see your blog. I wish you a very nice weekend. Eating natural instead of processed is a very good thing! What is the berry Eileen? Eileen, splendid photos. Thanks for sharing. I love trumpet vine and wish we had some on our farm, but they grow like crazy! How delightful to see your lovely photos gracing my computer screen, Eileen! Beautiful! Hi Eileen. Your Warblers are so sweet. I believe I've seen some in our Fort Worth area before. I enjoy your Saturday critter share. Hopefully, I can participate more in the future. I have a garden blog, where I would post some critters, but, somehow through Google Plus, the photos were lost from many of my posts, and I have not been able to retrieve them. So, I am starting anew. Have a wonderful weekend! Hi Eileen, Enjoyed the photos and joining up with the link! Hope you like my critters! :-) Thanks for hosting and have a happy weekend! Happy October to you too. Love the little birdies and flowers and berries. Your birds love those berry bushes! So neat that you can see them from your window. Cyndis are way out in back and it's already getting kinda chilly to sit quietly out there. No need to apologize for those pictures, I wouldn't have seen anything wrong...still don't actually. No critters for me again this week....thanks for sharing yours! I think even tho they're difficult to see, that is what makes this post all the more proper....that is TRULY nature. Thanks so much for the condolences of our losing Winston!! Much appreciated. I love seeing your pics of the warblers, Eileen! I'll be back with critters next week. The birds sure seem to like those berries. Great capture of the hummer. Just love the colour of that trumpet vine. Lucky you to be able to enjoy the hummers. I hope you are enjoying this first weekend of October. Nice shot of the hummingbird in action. Glad to see the birds have a berry feast:) Thanks for hosting and have a great weekend! Beautiful Eileen. Wishing you a lovely Sunday. It's a long weekend over here, so Sunday is even better today! Interesting. I had three hummingbird feeders out and only saw one or two hummingbirds. Guess I need more flowers. Thanks most sincerely for hosting this so wonderful link-up party warming my hearth and blessings my soul, given the charming blog posts which are always shared ! may it be as Beautiful as you, dearest Eileen ! Sharing this post was much appreciated for us birders this week at I'd Rather B Birdin'....for that, I thank you Eileen. Happy Sunday, Eileen- I hope you are having a wonderful day. Thank you for hosting! As always, your photos are so beautiful, Eileen !! Those are some very popular berries! PS: And thank you for hosting! No wonder the birds love you..so many Berries..They really blend in to them..
Love your warblers, Eileen. I rarely see them. So very beautiful. I did not realize that these warbles were such a tiny birds and also the Cardinal was much bigger in my imagination. wonderful photos of the tiny flowers and blossom. Oi Eileen, os pássaros adoram frutinhas, não é mesmo? O que estas, são amoras?? What great shots you got of so many different warblers! Very nice! I love the images with the little birds!